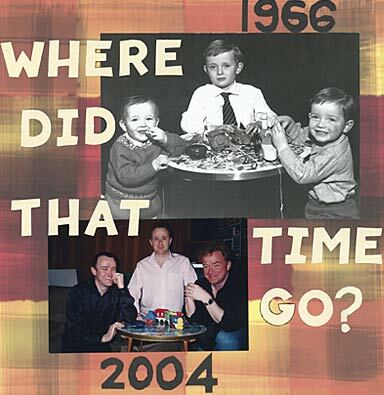 I was planning a 'generations scrapbook album' but the first layout that cried out to be done was this one - featuring my brothers and I captured around the same table - 28 years apart! Yes, that's me in the middle looking rather serious. I was dressed more formally in 1966 obviously. Weren't we all? This layout kind of created itself, once I had those two photos together. I'd forgotten that the table legs had been significantly shortened in the years that passed - otherwise my brothers would have been the size of garden gnomes! As the symmetry of the photos does so much of the 'impact work' in this layout, I went for a warm and cozy paper from Dovecraft and simple block lettering from Colorbok. As you can see, I've placed the same group in two different times. You can of course create layouts with three or even four (do I hear '5'?) generations within a single photograph. You could also place different family members in the same location at different times. Although I had the layout of this page pretty much in mind before I started, that's not often the case with me. That's why I'm very grateful to Jen Gormley for '500 Scrapbooking Sketches' , where she shows how to use a simple line drawn sketch to nail down the 'big picture' of what the layout wil look like. And of course the layouts are totally interchangeable for different themes. I haven't explained that very well - have a look at an example she gives us - on this page about half way down. I didn't feel that the theme of this page - the extraordinary passing of time - needed any extra 'embellishment'. All I added were the dates - cut 'free hand' (as if you hadn't figured! ).